Things have been a little quiet around my blog for the past few weeks because I am pregnant! Even though I love to cook, I had no energy during the first trimester along with a very picky appetite. Food finally sounds good again and I’m back to cooking! I know many women say it’s hard to eat gluten-free during pregnancy, because of all the cravings and food aversions. In my day-to-day life non-gluten-free foods don’t tempt me anymore. But during those first few weeks of pregnancy I thought I would die if I couldn’t have an Einstein’s bagel and cream cheese! Knowing what gluten does to my body and how it can even effect the baby during pregnancy prevented me from following through on any cravings. But it was hard! I will write a separate post about gluten-free pregnancy and how I got through the first trimester. In addition to celiac disease, I also have PCOS. I really think the two are related. We have wanted to have another baby for a few years now and are thrilled I am finally pregnant! Infertility is such a challenge for so many. I am believer that whole, real foods and a clean diet can help. When I’m pregnant a lot of the food I crave is food I grew up eating. My Grandma was known for her chicken and rice casserole. Unfortunately her recipe relies on cream soups and onion soup mix. When you eat gluten and dairy-free classic casserole dishes can be hard to recreate! Most of them rely on cheeses, white sauces, or cream soups for moisture and flavor. This casserole is full of flavor and gets its creaminess from cashew cream. If you don’t like cashews don’t worry, it doesn’t taste like them. 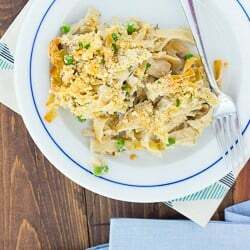 A combination of mushrooms, shallots, garlic, chicken stock, and a dash of gluten-free soy sauce make this casserole savory and satisfying. It can be made ahead and reheats wonderfully. For crunch, I sprinkle crushed organic corn chips over top of the casserole before baking it! This casserole can be made ahead of time and kept in the refrigerator until dinner. Just wait to add the corn chip topping until just before baking. It also reheats wonderfully. 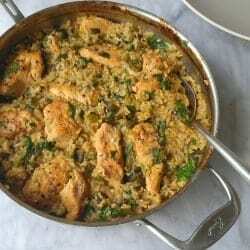 I cook 1 1/2 cups dry brown rice with 3 1/2 cups chicken stock in my rice cooker for this recipe. I also like using leftover rotisserie chicken. Preheat the oven to 375F. Pour 1 cup of boiling water over the cashews and let sit for 30 minutes while you prepare the rest of the ingredients. In a large dutch oven, heat the ghee over medium heat until shimmering. Add the shallots, mushrooms, garlic, and a pinch of salt and pepper. Cook until softened, about 7-9 minutes. Sprinkle the flour over the mushroom mixture and cook for 2-3 minutes. While whisking constantly, slowly pour in 3 cups of the chicken stock. Bring to a simmer and cook for about 5 minutes, until thickened. Meanwhile, drain and rinse the cashews. Place them in a high-speed blender with 1/2 cup of chicken stock. Blend until completely smooth. Add the cashews to the sauce mixture along with the soy sauce and hot sauce. Remove from the heat. 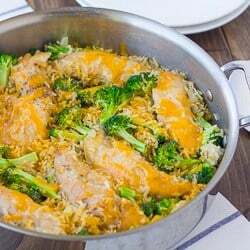 Stir the brown rice, chicken, and broccoli into the sauce. Taste and season with additional salt if needed and plenty of black pepper. Add up to 1/2 cup additional chicken stock if the mixture looks too thick. Pour into a greased 3-quart casserole dish. Combine the corn chips with the ghee and sprinkle evenly over the top. Bake for 25-30 minutes until bubbly and golden on top. Enjoy! Be sure to use coconut oil to keep this completely dairy-free. This is a really awesome meal. It tastes amazing out of the oven and re-heated for lunch. Definitely a keeper. We made this tonight and my husband and I devoured it. It is simply delicious and I am so amazed that a dish like this can be dairy-free. This was my first time using cashew cream, so I was a little skeptical. The casserole was delicious, though! 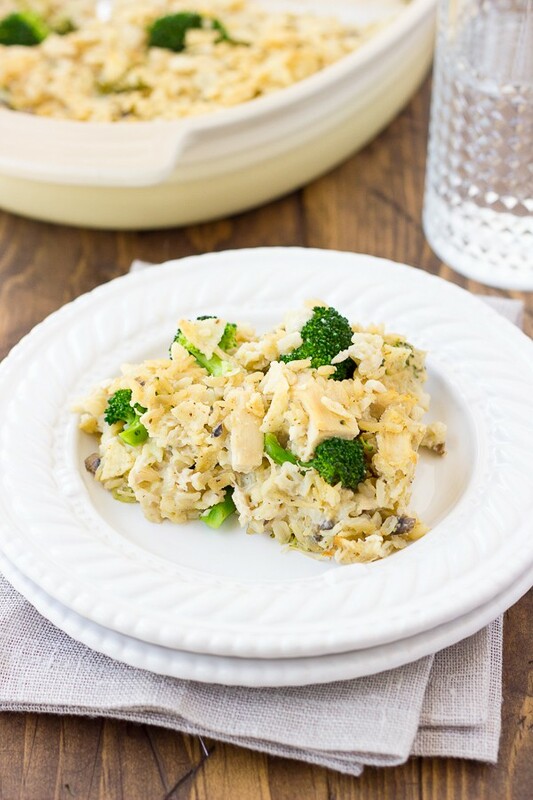 I’m excited to use the same idea with other dishes that traditionally use cream of mushroom. I haven’t been able to eat them in a long time because of the dairy. My sister-in-law, who didn’t have a milk allergy, wasn’t allowed to have any dairy, and was subjected to a non-dairy diet because her baby had skin problems of eczema due to dairy. She’s not had, nor will, have any milk, as a breastfeeding mother, whose awareness and her baby’s health is more important than her want, has made me conciseness effort, for their needs. I was proud to make a non-dairy meal, so that all would eat and not be burdened by that fact. She is also nut-allergic and I split her portion from a paste, so her and my nephew would be safe. I hope all could make this effort, because, when needed we should all give of ourselves to help those who we love and help one another, no matter the circumstances. Because, I followed this recipe, I gave my family a chance to see each other, which had been a month in the making. Thank you! My grandson is also allergic to dairy and all tree nuts among other things. What do you mean by you split her portion from a paste’? I’d really like to try this recipe for him. Dang! So good. I have a dairy sensitivity, but I’m from the deep south–which means that I MISS casseroles. 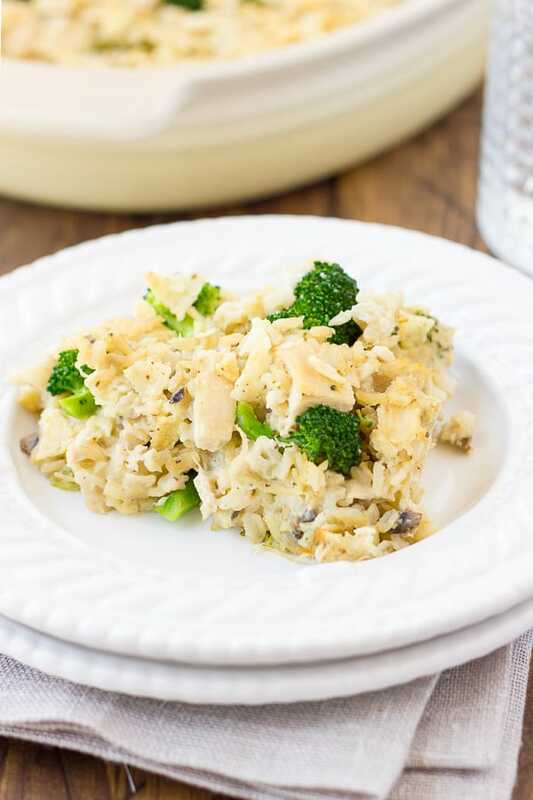 I’ve tried a number of recipes for dairy-free chicken broccoli rice casserole, and this one is by far the best (husband confirmed). The soy sauce (we used braggs liquid aminos) really gives it stellar flavor. Cashew cream is already a staple for us, but I didn’t know about the quick boiling water method!! Took a while to pull this all together, but it was a pleasure to cook with all those yummy aromas, and the end result was outstanding. Thanks! I’m so happy you liked it! Thanks for reporting back! How many will this casserole serve? I am preparing for 16 adults (8 men, 8 women. I plan to serve a salad with it. Hi Mary! I might consider making 2 casseroles for that size of crowd. This recipe serves about 8-10. I hope you like it! Everyone loved the casserole. I used gluten free mushroom soup rather than the cashew sauce. Everyone wanted the recipe. Thank you.My gluten free friend said he had been ages since she had gone to a party and eaten what everyone else did. Are the cashews supposed to be raw? Or can I use the roasted and salted that I have on hand? This is the first I’ve heard of cashew cream, so this is all new to me! TIA! Great question! Yes the cashews are supposed to be raw. I hope it works out for you! Can this be frozen and reheated successfully? Hi Linda! I haven’t tried freezing this so I can’t say for sure. I would probably try freezing it in individual portions and reheating it covered in the oven/microwave. I would also leave the topping off. I hope this helps! Hi! Can I use anything other than cashew? You could use unsweetened almond milk. Just skip the cashews and the broth and use 1/2-3/4 cup almond milk when you blend up the other sauce ingredients. Let me know if you have any more questions! i don’t have any cashews- can I use Almond Milk? Almond milk will have a different flavor and won’t turn out as creamy, but it still might work! Do you think a commercial cashew butter like Jiffy would work, save time and a blender or would it be to sweet? I don’t think that would work, unfortunately! I think it would be too sweet. There is a glitch in your ingredients. It says “A3/4 cashews”. Is that 3/4 or 1 3/4? I did the 1 3/4 and had to play with it a bit, but ended up with 2 casseroles. It is the first time I had tried the cashews as a sauce. It was good. Sorry for the confusion! That happened to some recipes when I switched my blog design over. It is supposed to be 3/4 cup. I updated the recipe. Glad the sauce still worked for you! Is the broccoli raw or cooked when it goes into the casserole? Sooo delicious!!! I used Quorn brand chickenless chicken, veg broth, regular flour, and bread crumbs as I didn’t have corn chips on hand. My picky husband (he is Indian and usually doesn’t do seconds of “American” dishes) and 4 year old gobbled it up! I made this. Thought it was great it was gluten and dairy free. But the sauce is rather bland. I had to doctor it up with more spices and some curry and parsley and more hot sauce and tamarin sauce. I don’t know if I would make it again, my husband said it was okay, but I wouldn’t make it again. Sorry it didn’t turn out for you! I just want to hug you. I’m in my first trimester for my 5th child and we have a strict diet in order to heal my 6 year olds autism. I just connected with everything you wrote and wanted to say thank you, for sharing yourself with all of us, as well as a recipe that doesn’t sound disgusting-like everything else does at the moment. Hello, If I want to bring this to someone can complete all the steps except the bake then refrigerate the casserole and let them bake it? Yes! Just leave the topping off until just before baking. Hi Erin, do you have any idea whether coconut milk as a sub for the cashews and broth would ruin the flavors of the casserole? I have that on hand and want to make this for a new Mom who’s celiac. I haven’t tried it myself! I think it might be ok though!